Cover Line: Something’s waiting in the dark…. Back Line: Live Plants…Dead People? Book Description: Dr. Brewer is doing a little plant-testing in his basement. Nothing to worry about. Harmless, really. But Margaret and Casey Brewer are worried about their father. Especially when they…meet…some of the plants he is growing down there. Then they notice that their father is developing plantlike tendencies. In fact, he is becoming distinctly weedy–and seedy. Is it just part of their father’s “harmless” experiment? Or has the basement turned into another little shop of horrors? Margaret and Casey are confused. Their dad, Dr. Brewer, hasn’t been himself ever since he was fired from his job at PolyTech. He hardly speaks to them, he’s wearing baseball caps, he stays up late, he spends all day in the basement, and he puts all his time and money into his hobbies. But what Margaret and Casey don’t know is that dad is probably going through midlife crisis. Or at least that’s what I thought. As the story goes, After Dr. Brewer is fired from his job at PolyTech, due to some experiment gone wrong, he moves his work to his basement at home. There he establishes a lab that he locks and forbids anyone from entering. And already you have to think that even Mrs. Brewer might be a little suspicious of what her husband’s really up too. But oblivious to her husband’s change in personality she leaves town to help her sick sister. When their parents leave to the airport, Margaret and Casey, along with their friend Diane, debate taking a look at Dr. Brewers work. Finally cracking, they all decide to go take a look and as they descend the stairs into the basement, they discover dozens of tall, fruit bearing plants. They find this odd considering that their dad only started work down here a few weeks ago. It’s hot down there and for some reason Casey takes off his shirt. As the kids continue to look around, they begin to hear heavy breathing coming from the plants. After being freaked out by the human sounds emitting from the plants they decide to leave the basement. As they enter back into the kitchen they notice Dr. Brewer pulling into the driveway, and that’s when Casey realizes that he left his shirt downstairs. As he hurries to retrieve it, Margaret notices that Dr. Brewer gets caught up talking to a neighbor, leaving Casey more than enough time to hurry back up with his shirt. Right? As Dr. Brewer wraps up his chat and starts to come inside, Margaret starts to scream to Casey who in the process of grabbing his shirt, is grabbed in return by one of the heavily breathing plants. Hurrying downstairs Margaret rushes to help Casey so they can run back upstairs in time before their dad returns. But as they begin to trot up the steps they see Dr. Brewer in the doorway. Instead of freaking out, he sits them down and calmly explains that someday he will explain what he is doing in the basement, but until then, he insists the children stay safe and out of the basement. To be sure they follow this decree, the next day locks are newly placed on the basement door. Later on Margaret talks to her mother on the phone and tries to explain her concern. But Mrs. Brewer isn’t buying it (because she realizes that Mr. Brewer is going through mid-life crisis, and Margaret is growing into her rebellious teen years). Anyway, after Margaret hangs up, she heads downstairs to talk to her father. When she enters the kitchen that leads to the basement, she is startled to see her father at the sink. Curious of what he’s up to she watches him from around the corner. As she spies him, she notices that he is eating something and quite ravenously at that. After finishing, throwing something in the trash, and heading back to the basement, Margaret creeps out to investigate. When she opens the trash she discovers a freshly emptied bag of plant food! Soon after finding this, she tells Casey who seems to not want to put the obvious puzzle together. But a few days later as the two are playing Frisbee, Casey excitedly sails a throw to his father who isn’t paying attention. The Frisbee knocks of his Dodgers cap revealing a balding head with tiny leaves sprouting from the scalp. Pretty freaked out, the kids are sat down, and Dr. Brewer explains how it’s a side effect from the work he’s doing in the basement. What big daddy Dr. Brewer tells the kids is, that he has been working with both plant DNA, and animal DNA, and pretty much trying to play God. Basically. And though Casey gets sold on this, Margaret still feels that something’s not right. Later that night, while lying awake, she hears her father walking in the hallway and decides to try to confront him again. Finding that he is in the bathroom, she peeks in and is frightened to see her father unwrapping his hand and revealing a gash oozing green blood. The next morning, while explaining what she saw to Casey, Dr. Brewer announces that he has made them lunch. Suspicious the two sit at the table and quiver as they are served a dish of what is best described as green mashed potatoes. Saved by the door bell, Dr. Brewer goes to answer it giving the kids enough time to scrape their plates clean, only to announce they ate it all. At the door is Mr. Martinez, Dr. Brewer’s old boss. Feeling somewhat guilty for firing Dr. Brewer, he wanted to swing by and see how his “work” was coming along, and if it was good enough, maybe he could get his job back at PolyTech for him. Surprised, Dr. Brewer guides him downstairs. The next day while Dr. Brewer is out helping a neighbor fix a sink, the siblings get bold again, and go down in the basement. Although not very smart, we get to see Casey’s bright future as he picks the lock to the basement. I do believe he’s like 11 years old. Anyway, while snooping they come across Mr. Martinez’s neatly folded suit. Realizing they never saw Mr. Martinez actually leave the house yesterday, the two begin to speculate what actually happened to Dr. Brewer’s boss. Suddenly they hear footsteps upstairs, and rush up to the kitchen but are caught once again by their father. Startled to see the siblings holding the suit, Dr. Brewer explains how yesterday Mr. Martinez got hot in the warm climate of the basement and took off his suit coat and left without it. Fully understanding this, especially because Casey had done the same thing, they accept their father’s lame excuse. Upon awaking the next day, the kids are excited to hear from their father that their mother is coming home that day. As Dr. Brewer leaves, Casey becomes so happy that he insists that he and his sister fly kites until their mother returns. Sounds like a good idea, but the kites are in the basement. So after they break in, again, they go in search of the kites, and stumble upon Mr. Martinez’s shoes and pants. It is then they begin to realize that Mr. Martinez probably didn’t leave the house half naked. Suddenly they hear a bunch of thumping and knocking coming from a supply cabinet close by. After breaking into that too, they find some pretty disturbing plants, some with faces, and some with arms. Through the anthropomorphic foliage though, Margaret spies a couple pairs of feet with human legs attached. Pushing past the weird plants they find Mr. Martinez, who we must think is gaged in his boxers, and their father! As the two help the captured men out of the closet the one that looks like Dr. Brewer quickly tells the kids that he is their real father, and that the other man on the way to the airport, is a plant clone of himself. After being untied the new Dr. Brewer leaps to a corner grabbing an axe and heads for the stairs. But as he does the “imposter” Dr. Brewer comes rushing down the steps with Mrs. Brewer. Ok, this is where it gets a little confusing to describe. So, the Dr. Brewer with an axe has no hat on, so he’s cap less Brewer, and the other is capped Brewer. Okay? Okay, so, cap less Brewer with the axe tries to convince he’s the real father, the same for capped Brewer. Finally Margaret charges cap less Brewer and retrieves the axe. Then she is faced with the choice of who is her real father. To make it quick; she gets a knife from Casey and she slices cap less Brewer only to see his red blood. So that automatically makes him the real dad supposedly. She gives him the axe and he splits cap wearing Brewer right in two down the middle. Wow, a natural M. Night Shyamalan stuff right there. So what do you think? Yes, yes, I know it’s a children’s book, but it is quite fun to go back with adult eyes and re-see and re-read these things and how you interpret them now that your older. I initially thought this one was better than Welcome to Dead House, but still found some parts pretty cheesy. But on the contrary there are some pretty funny passages that I found, and makes me wonder if R.L. Stine was trying to get a few chuckles in there as well. “Why do you want to do this?” Margaret asked her friend. “Why are you so eager to go down there?” Diane shrugged. “It beats doing our math,” she replied, grinning. There are many others as well but you will have to give it a read and find them for yourself. I did this review differently from the last. Its longer, and more in depth in the story, and I was wondering if this is better, or if I should keep it shorter and smarter. What do you think? Let me know by dropping a comment below or email me at unspeakablegibberer@live.com. All in all I kind of liked this one, I just hope they get a little better down the line. Cheers! This entry was posted on March 11, 2012 by David Joseph. 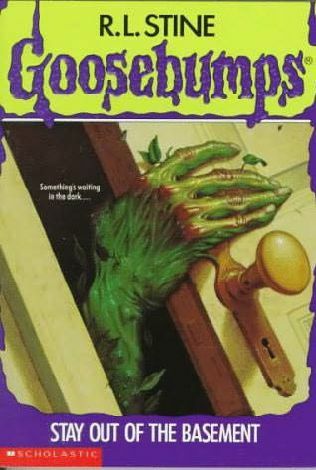 It was filed under Books, Goosebumps, Reviews and was tagged with Goosebumps, R.L. Stine, Stay Out of the Basement, Welcome to Dead House. I remember reading this book, or at least you telling me about it. Nice narrative. Thanks. After I finished reading it I kind of had a flash memory of me trying to explain this one to you when I was young. Thanks for listening dad!